Living a Fit and Full Life: WaterPura - Chemical-Free Baby Water Wipes are Great for Baby's Delicate Skin! WaterPura - Chemical-Free Baby Water Wipes are Great for Baby's Delicate Skin! products for major grocery and drug store chains. and receives logistic and resource support from Crescent Manufacturing. baby wipes were part of the problem, and began her search for something better. packs was a success. She is proud and excited to bring you this chemical-free alternative to conventional baby wipes. As a mom of 4 I've used many baby wipes in my time as a mother and I have to say that I absolutely love WaterPura's wipes. I love that they're all natural and that they seem to clean extremely well. The wipes have no odor or strong smell to them which is important to me as I'm somewhat sensitive to strong smells. I've been going more and more towards natural products every year as I hope most of you are as well. WaterPura's wipes are soft but still strong which is a must have for big cleanup jobs. I also love that they're American-made! WaterPura's wipes are perfect for baby's delicate skin on their bottoms, hands or anywhere else for that matter. WaterPura's wipes are the perfect size and don't fall apart while cleaning which is also a requirement I have for wipes. I'm incredibly amazed at how many wipes I've used in the past that just don't perform well. 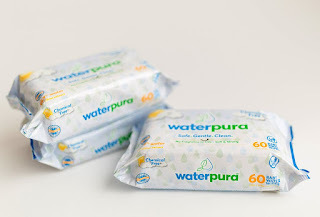 WaterPura's wipes are terrific and I highly recommend them! Click HERE to learn more about WaterPura! 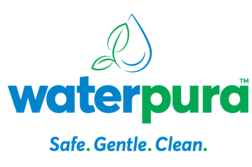 Follow WaterPura on social media!